HamilTunes: who are we and what do we think we're doing? belief that children learn music best by listening to and imitating characteristic tones and styles. I believe band directors should perform live for their students as much as.possible. * Awarded "Distinction in Performance"
* Initiated Boston area ensembles Brass Planet and ¡Klezperanto! 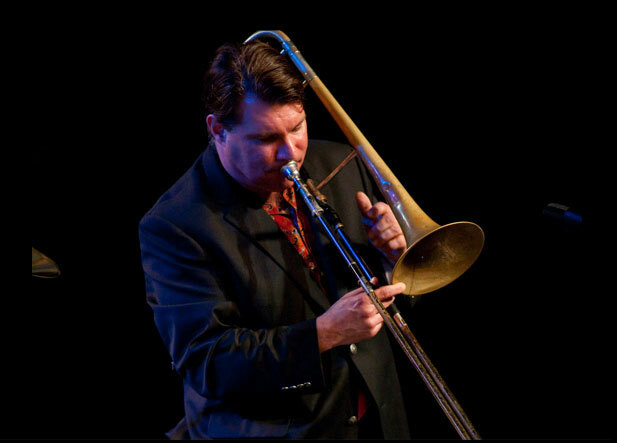 Mark Hamilton has been trombonist of the Klezmer Conservatory Band since 1985. Playing Yiddish music has been very good to Mark as he’s toured throughout Europe, Australia, and North America and recorded nine CD’s. He has filmed a children’s video for Rabbit Ears Productions entitled The Fool and the Flying Ship with narration by Robin Williams and been featured in Joel Grey’s Yiddish music revue Borschtcapades ’94. Mark has appeared on stage and in the pit orchestra with the American Repertory Theatre’s production of Shlemiel The First receiving rave reviews in the New York Times, the Village Voice, the New Yorker and Newsweek. He has performed in the PBS special In the Fiddler’s House and on The Late Show with David Letterman with renowned violinist Itzhak Perlman and was heard on Minnesota Public Radio’s A Prairie Home Companion with Garrison Keillor. A talented educator, Mark is on the jazz faculty at Blue Lake Fine Arts Camp in Michigan and is the former Instrumental Music Director at Applewild School in Massachusetts where his bands consistently won top honors at the International Association of Jazz Educator’s festivals. A proud graduate of New England Conservatory and the University of Delaware, he is also a founding member of the Boston area ensembles Brass Planet and.¡Klezperanto! · Initiated Boston area ensembles Brass Planet and ¡Klezperanto! · Awarded "Distinction in Performance"
· Teaching Assistant, "Aural Training and Improvisation"
Teaching Instrumental Music Learning Theory using "Jump Right In"